I like to joke with freinds that anytime I get to spend in Rocky Mountain National Park is like sunshine and rainbows. In my opinion there are few places better to spend time in then Rocky Mountain National Park, so even if there are not sunshine and rainbows that particular day, it always feels like it to me. Of course its not meant to be literal but sometimes serendipity strikes and it becomes literal. 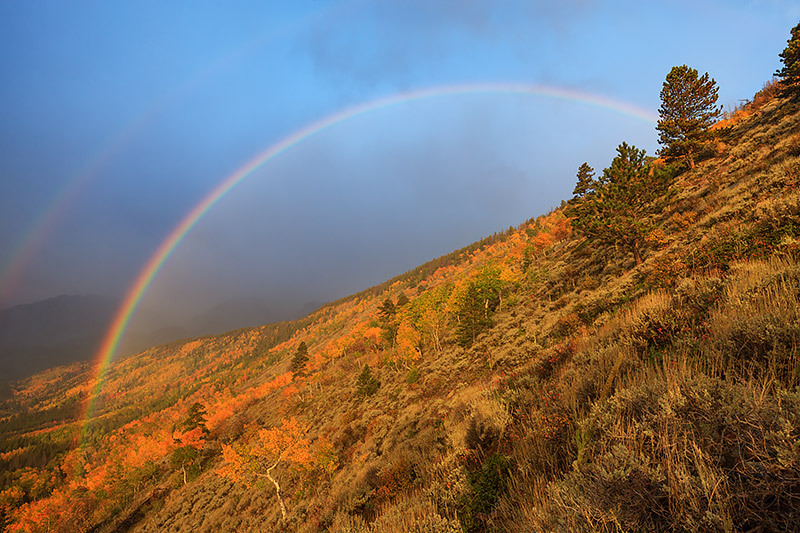 It's hard to describe the feeling when one is perched along the side of the Bierstadt Moraine photgraphing Rocky's beautiful fall colors and golden aspen tree's and a rainbow appears over and already stunning landscape. Moments like these are fleeting and may be once in a liftetime events so it becomes a test to both photograph this beautiful scene, while at the same time making sure I'm staying in the moment and enjoying the beauty unfolding before my eyes. Even the famous Hudson River School painter Albert Bierstadt whom the moraine is named for would appreciate such a stunning display of natures beauty. Photo © copyright by Thomas Mangan.